Light detection in animals varies from a simple photosensitive organ in flatworms, which only provides a measure of the direction and intensity of light, to birds of prey that can detect rabbits from altitudes of 6 to 9 miles (10 to 15 kilometers). In the visual system of vertebrates, the lens focuses on an object and activates photoreceptive cells on the retina. These cells convert patterns of light into neuronal signals, which are transmitted along the optic nerve to the visual cortex in the back of the brain, and then to higher cerebral centers for information processing. Prior to the seventeenth century, the gross structure of the eye had been established and, thereafter, attention was directed to function. In 1604, the physicist-astronomer Johannes Kepler determined that the retina—and not the cornea, as was previously believed—was responsible for the detection of light. Almost two centuries later, the English polymath Thomas Young focused his attention on the eye. Young, a Renaissance man, was only a physician and physicist, but he also made significant contributions in language and music, and was among the first to decipher some inscriptions on the Rosetta Stone. In 1793, he described the ability of the eye to focus on near and distant objects depending upon muscles that changed the shape of the lens. First hypothesized by Young in 1802, the famed German physicist Hermann von Helmholtz in 1850 developed the theory of trichromatic color vision, in which there are three sets of color-perceiving elements in the retina: red, green, and blue. The Young-Helmholtz theory serves as the basis for primate color vision. During the 1830s, the retina was found to contain two types of cells called rods and cones because of their shape when seen under a microscope. After studying and comparing the eyes of nocturnal and daytime birds, in 1866, the microscopic anatomist Max Schultze discovered that the cones detected color, while the rods were highly sensitive to light. As might be anticipated, different animals have different numbers and relative proportions of each cell type. In 1991, a third type of photoreceptor was discovered that governs the body’s circadian clock. SEE ALSO: Circadian Rhythms (1729), Localization of Cerebral Function (1861). The great horned owl (Bubo virginianus) is the most widely distributed owl in the Americas. Having eyes almost the size of human eyes, their retinas contain many rod cells for excellent night vision. 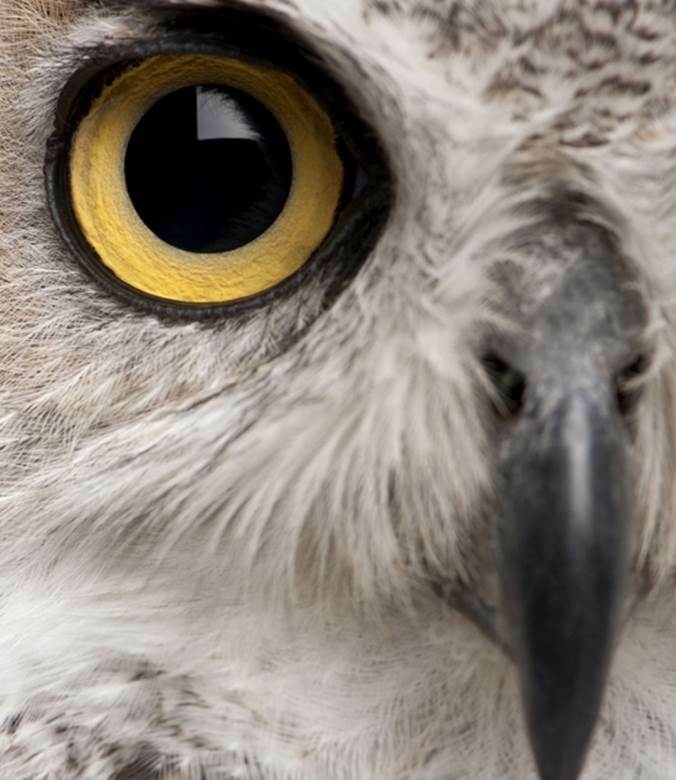 Owl eyes don’t move in their sockets, but these birds of prey can swivel their heads 270 degrees, enabling them to look in any direction.